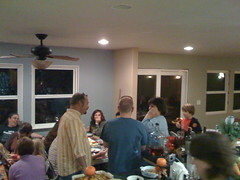 We had a wonderful Thanksgiving this year–lots of family and friends, good food and drink, and great company! But as usual with such an ambitious project, there was room for improvement. Here’s what worked well, and how we can do a better job *next* year. For reference, please see the [2008 Thanksgiving menu][menu-2008]. – Aditi’s samosas were a smash, the very first thing we ran out of IIRC. – Peeling the deviled eggs was a pain. Next year don’t use ultra fresh eggs. Maybe add a little vinegar to the water also. (Test this ahead of time to make sure it doesn’t change the taste.) On the positive side, we cooked 2 dozen eggs for 27 people, which was the perfect amount–we had 4 halves left over. – We did a baked brie, but the cheese was too big. Stick to an 8 oz brie, preferably not triangular. Also we should *not* have prepped this early, since the jam soaked through the filo dough. – Our cheese tray had four cheeses (4-8 oz each). We sliced up one pear, which was the right amount for that. – Four cans of black olives weren’t enough. We could have used more olives, preferably a variety. – We did an 11 lb ham and 18 lb turkey. This was a good amount for 27 people–enough leftovers for sending home, sandwiches, etc. – Turkey in a browning bag came out nice and moist, but we didn’t get enough gravy. We’re going to try a large covered roasting pan next time. – We made about 7 lbs of potatoes. Although we didn’t run out, I think some of the folks toward the end of the serving line took less than they wanted because it was obvious we were running low. We should probably plan on 1/3 lb per person next year. – A single recipe of cranberry sauce *might* have been enough, but I don’t know if we’d have leftovers. Eek! We’ll stick with a double recipe for this size crowd. – 1.5 recipes of “awesome strawberry stuff” was too much. We didn’t even touch the extra half recipe, so just make a single. – We made both our traditional candied yams as well as sweet potato casserole, two large sweet potatoes for each. 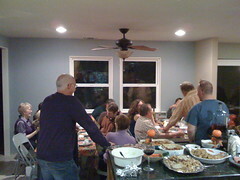 The casserole was a hit, and almost nobody ate the candied yams. (In fact, I think most people who *did* take some only did so to be polite.) Next year we’ll skip the candied yams. – Two apple pies was too much. Everybody went for the French apple pie, so don’t bother with the country apple. – Not many people tried Karthik’s halwa (kind of a carrot pudding, fantastic!) I wonder if we should have put this out during the main course? – We asked everybody to bring drinks, but I guess we weren’t sufficiently clear about that. Some of our guests thought that they were responsible for *all* the drinks on their own. Result: we have ***lots*** of leftover drinks. Perhaps next year we should have people bring 500-1000 mL per member of their party, e.g. a bottle of cider per child or a bottle of wine per adult. – We let people seat themselves, so we ended up with many folks sitting down with people they eat with every day, plus a few “outsiders” who were sort of out in the cold. We should have done a seating chart to keep branches of the family from dominating their tables. Also, both of our foreign guests (my two student assistants from India) ended up at the same table. We should have placed them at separate tables so more people would have a chance to speak with them. 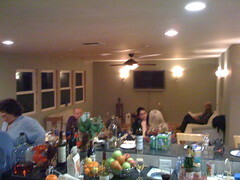 – Two tables (8- and 6-person) fit in the nook by turning them so the ends butted into the south wall. We got our 10-person table in the central hallway between the nook and great room by putting a carpet runner on the hardwood floor (to keep the chair legs from scratching the floor). – The bar could accommodate 8 people if we had 4 more bar stools. – We could put another 10-person table in the great room, but it would have to be set up right before dinner and taken down immediately afterward. – Max 42 people without shoehorning anybody, not including infants or other non-social diners. One thing where we really screwed up, though–we didn’t take nearly enough pictures! Barb used an online [serving calculator](http://www.oceanspray.com/planit/planning/serving_calculator.html) to estimate some of the quantities. It was reasonably accurate, but always take your own guests’ preferences into account.